Minimum of 4 riders may be required before a tour goes forward. Riders are responsible for any damage to Segway. Must be at least 14 years old. Guardian must also ride along with those under 18. Must weigh between 100 and 260 pounds. Must be capable of climbing a flight of stairs unassisted. Must wear closed-toe flat shoes and provided helmet. You may bring your own helmet. Must sign liability waiver. Click here to view liability waiver. Must have valid state-issued ID. Riders are responsible for any damage to Segways. Cash, Mastercard, Visa, Discover and American Express accepted. No checks. Rain policy: Tours will be run in light rain. Please dress appropriately. In the case of severe weather, tours will be rescheduled for another time or day. Detroit Segway will make the decision to cancel/postpone a tour one hour before tour time. We’ll call the phone number you provide in the case of postponement or cancellation. If you do not hear from Detroit Segway (please check your voicemail and/or feel free to call us) the tour will go forward at the appointed time. Weather where you are may not be the same as it is in downtown Detroit. Deposits will not be refunded if you do not show. Refund policy: No refunds will be given unless a tour is canceled by Detroit Segway. Please consider the weather, temperature and other engagements when booking your tour date/time. If you are unsure about your ability to ride, make an appointment for a test drive prior to booking a tour. 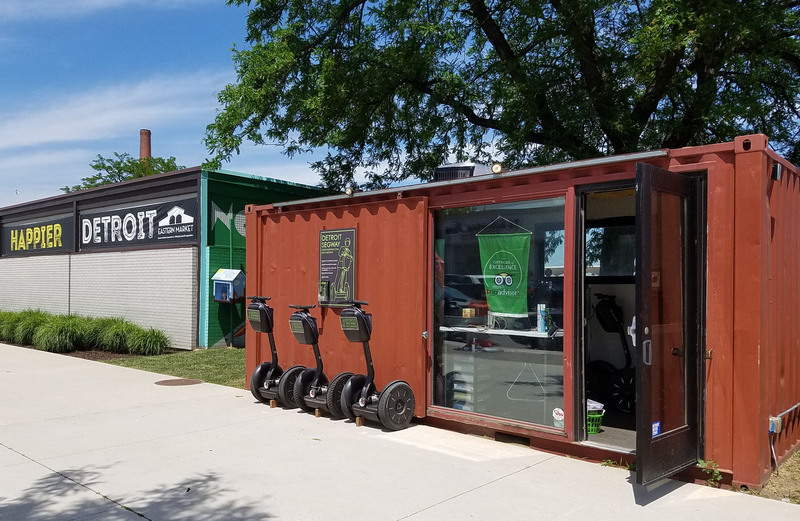 This NOTICE AND DISCLAIMER is made to all customers and purchasers of Segway® and Ninebot® products or services from Detroit Segways, LLC dba Detroit Segway. You are by this NOTICE advised that Segway® and Ninebot® products are sold and services are rendered by independent dealers, experience centers and distributors and that Detroit Segways, LLC dba Detroit Segway is also an independent, authorized dealer/ distributor/tour of Segway Inc. Each dealer/distributor/tour, including Detroit Segways, LLC dba Detroit Segway, is an independent business, completely separate from and is an independent contractor to, Segway Inc. Except for Segway Inc.’s granting of a limited license to Detroit Segways, LLC dba Detroit Segway to use certain trademarks owned by Segway Inc. or Ninebot (Tianjin) Technology Co., Ltd. in connection with the sale and promotion of genuine Segway Inc. or Ninebot (Tianjin) Technology Co., Ltd. products or services utilizing genuine Segway Inc. or Ninebot products, Segway Inc. does not control any independent dealer/SAEC/distributor and Segway Inc. does not own, operate or control the website(s) used by Detroit Segways, LLC dba Detroit Segway to advertise, promote and sell genuine Segway Inc. or Ninebot products or services utilizing genuine Segway Inc. or Ninebot products. To the extent permitted by applicable law, Segway Inc., hereby DISCLAIMS any liability for any intentional or negligent act by any dealer/SAEC/distributor, any representations made, and/or any damage to any Segway or Ninebot product caused by an act of any dealer/SAEC/distributor. Segway will not be responsible or liable for any damages caused by any dealer/SAEC/distributor, including any dealer/ SAEC/distributor identified as an “authorized”dealer or an “authorized”tour. Segway Inc., as the manufacturer of the Segway Personal Transporter and Segway SE-3 Patroller and Ninebot (Tianjin) Technology Co., Ltd., as the manufacturer of the Ninebot E, Ninebot One, Ninebot by Segway miniPRO, offers separate limited warranties to all customers and buyers of their respective branded products. Those limited warranties are separate and apart from other or additional warranties or guarantees offered by any dealer/SAEC/distributor and neither Segway Inc. nor Ninebot (Tianjin) Technology Co., Ltd. will be responsible for any representation or warranty made by any dealer/SAEC/distributor. Any statement in any advertisement, literature, brochure, or website should NOT be interpreted or construed as expressly or impliedly creating any relations between Segway Inc. and any dealer/SAEC/distributor, including Detroit Segways, LLC dba Detroit Segway.